1. All top workplaces invest in low-cost on-site amenities and policies that make biking to work easy . Whether it’s good bike parking, showers, or incentives, employer support makes a difference. 2. All top workplaces are in very close proximity to great bike infrastructure. Eight of the top ten are within a block of bike paths separated from traffic. All of the top fifteen are within ⅓ of a mile. What is the #1 Bike to Work Company in Seattle? The Allen Institute leads large Seattle workplaces with 21.3 percent of commute trips made by bicycle. Allen Institute is immediately adjacent to safe bike infrastructure, namely the award-winning Westlake cycle track that delivers thousands of riders into downtown Seattle. 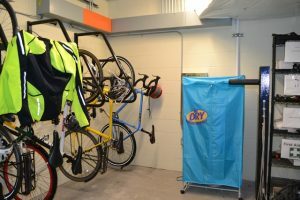 When the South Lake Union-based bio-science company planned its move from Fremont to its new building on Mercer Street in 2015, it ensured its new facility included secure bike storage, as well as lockers and showers for bike commuters. The company also has a Bike Committee that helps plan and coordinate bike commute events and promotions. According to Trygve Bakken, an Allen Institute scientist and Bike Committee co-chair, they will even help employees map out their bike commutes, showing the ideal route and which streets to avoid. New employees are also given an orientation that includes a tour of the bike facilities. 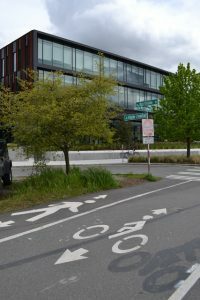 This year, SDOT is extending protected bike lanes near the Allen Institute, along 9th Ave N from the Westlake cycle track to Mercer and connecting to Dexter. Comcast Technology Solutions, a local online video subsidiary of Comcast, is located right on the 2nd Avenue Protected Bike Lane in downtown Seattle. 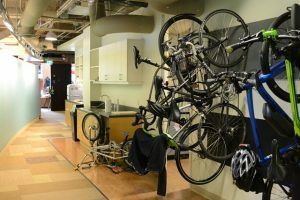 The company allows its bike commuters to keep their bikes by their desks or on hanging bike racks located in hallways, and also provides showers and towel service for its employees. This has led to a bike rate of over 10 percent, or more than three times the city average. “Having leaders in our company as active bike commuters also helps employees feel comfortable coming in on a bike – even when the weather is miserable. It promotes a healthy environment, community, and company culture, and tends to draw in quite a diverse employee base. I think it is a key to our company’s continued success in our Seattle outpost.” -Brian Hanson, Executive Director of IT. For Tableau, whose Fremont campus is located along the Burke Gilman Trail, active commuting is a way of life for many employees. On-site amenities include secure, indoor bike storage, showers with towel service, lockers for bike commuters, and an indoor bike repair station. 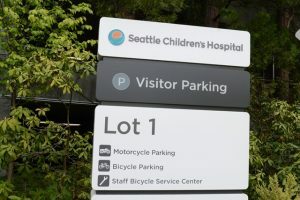 Seattle Children’s Hospital, with its main campus across the street from the Burke Gilman Trail, offers one of the city’s more innovative employee bike benefit packages. First, the company provides a daily commute bonus, which can total $1,000 per year, for not driving alone to work. Further, any employee who commits to riding a bike to work at least twice each week can receive a company provided bicycle and necessary gear, including helmet, lights, and lock. Seattle Children’s also has a full-service bike shop on its main campus, providing free tune-ups to employees. But mostly, she feels it’s important for Children’s employees not to drive to work so that the hospital can grow to serve more patients without needing to add more employee parking. More than 1,100 Children’s employees bike to work across its multiple locations. Commute Seattle recognizes top bike to work companies for making investments in employee benefits and on-site amenities, and encourages local government and neighborhood groups to continue building a citywide network of safe bike lanes. With public and private sectors working together, Seattle can increase the number of bike commuters at low cost and help relieve pressure on our congested roadways. Learn more about what your company can do to create commute-friendly policies at www.commuteseattle.com/go. Check out recent Commute Seattle coverage in the Seattle Times and Seattle Bike Blog.